From the moment your children start moving, accidents start happening. You have to be aware of every last wire, plug socket, anything within reach of tiny hands. As they get older things tend to get worse rather than better because they rush around, don't look where they are going and generally like to do the opposite to what you are telling them to do. My 5 year old has become that bad that she is now known as first aid Freya as this is where she spends the majority of her time at school!!! 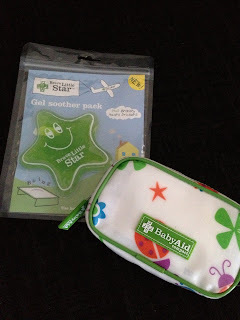 Now as a mum, we like to be prepared for anything and this is where the lovely people at Baby Aid come in very handy. They are very passionate about child safety and being prepared for those unforseen situations and they specialise in first aid kits for babies and children. I received one of their first aid kits and one of their gel soother packs in the post and you can see how they have aimed it at the younger generation, colourful and fun packaging, which instantly would calm a child rather than frighten them more!! The gel soother has been cleverly made named the Brave Little Star and you guessed it, is also the shape of the star. The bright green colour and lovely smiley face on it is instantly appealing to children. It can be used either warm or cold and is the perfect size for little hands, this also means a great size to take when out during the day or when on holiday. The unfortunate thing about having to review these products is that one of my children would have to get hurt in order for me to try them out. However I also knew it wouldn't be long until someone got hurt. Our first victim was little Gracie. She fell over just outside of our front door on the way home from a trip to town. Luckily I had kept the gel soother in the fridge for an occasion just as this. 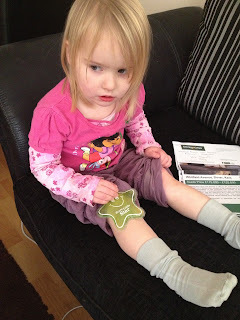 It was lovely and cold, so once we had checked that there were no cuts, Gracie actually place the star on her knee by herself. 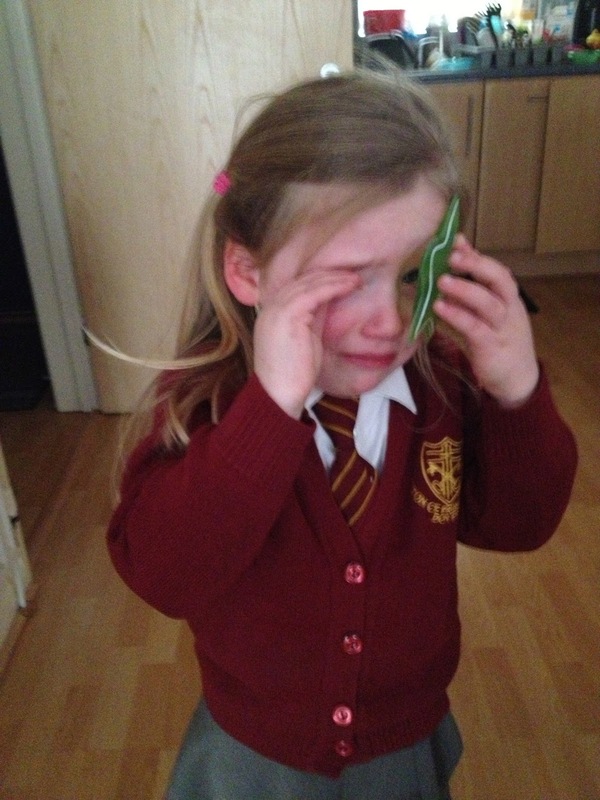 As if by magic the crying stopped and she proceeded to put it on her other knee when the 1st one had stopped hurting. She even pretended that her head hurt too just so she could keep the star out for a little bit longer!! The next poor soul to get hurt was our very own first aid Freya, don't ask me how but she managed to knock her head on the pushchair and of course it meant that our brave little star had to come out to help. The star did it's job very well. Again Freya wanted to hold the star by herself which left me with my hands free to check that there were no cuts etc. Although it took a little longer this time for the pain to go (slightly exaggerated I thought!). Infact it took that long that the poor star turned warm but it was easy enough to make it cold again, we just ran it under the cold tap for a few seconds and back it went on Freyas head. The brave star was certainly making my children very brave and made it a lot easier to calm them down. I keep it in my handbag just incase an accident should happen when we are out and about. And the best thing is you can buy refills, either individual pieces or full packs. In conclusion I would highly recommend these items to any parent. As the saying goes, always better to be safe than sorry and with these items you are prepared for anything that might happen to your children and if yours are anything like mine, they definitely like to keep you on your toes!! !